Home » What Are the Different Types of Kettlebells? What Are the Different Types of Kettlebells? The kettlebell. A simple, yet incredibly versatile piece of equipment that in our opinion, is underutilized in most gym settings. A lot of gyms have kettlebells present, but not every gym sees them used. We don’t think the lack of use has to do with a dislike of kettlebells, but more so an unknowing of their uses and types. In this article, we’re going to discuss the different types of kettlebells, which can hopefully help you learn more about this dynamic piece of equipment, and also entice you to use them a bit more in your workouts. We’ve written a ton on kettlebell workouts and how they can be useful, but this will be our first piece covering different types of kettlebells. So, how can a ball of metal attached to a handle be so different? You’d be surprised. Hopefully, by the end of this article you’ll have a pretty good understanding about the different types of kettlebells, and their applications. Knowing all of this will help you find the best kettlebells to use and potentially buy. In the vast world of kettlebells, there are two basic types of kettlebells that should be understood whether you use them frequently or sporadically. Now, there are a lot of different types of kettlebells in respects to shapes, designs, and aesthetic appearance differences, and as the market grows, so does the creativity of a kettlebell’s construction. Yet, at the end of the day there tends to be two different kettlebell types that run true across the board, even if your kettlebell looks like Darth Vader. When most think about kettlebells, they think “cast iron”. This is your standard looking kettlebell that has the handle that is typically wider than the bell itself. 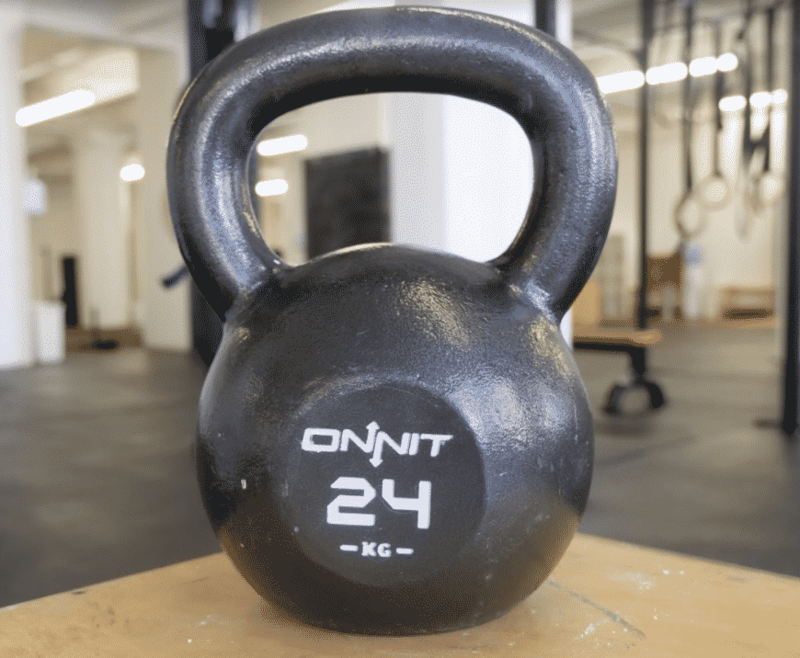 You’ll see this bell most commonly in commercial, CrossFit, and home gyms, as it’s the most versatile option of the different types of kettlebells. The material may very slightly between different cast iron builds, but the shape typically runs true with the wider handle, even for lighter bells. Recreational lifters who casually or regularly use kettlebells in their training. Lifters who want to do two-handed movements like swings and goblet squats. Newer kettlebell users who may not be used to gripping handles for long periods and need a wider width. Competition kettlebells are slightly different than your standard cast iron kettlebell in a couple ways. First, these kettlebells will have slightly smaller handle diameters. For competition in the American Kettlebell Alliance, all competition kettlebells require a 35mm diameter, and some companies make competition kettlebells with 33mm handle diameters. Second, the dimensions of competition kettlebells are all regulated, and the handle will align with the bottom portion of the bell. This slimmer and skinnier handle is to allow better and more seamless one-armed movements in competition. Also, it keeps kettlebells consistent for both male and female athletes. Lifters and athletes who might want to compete in formal kettlebell competition one day. Smaller handed individuals who can fit both hands within the handle’s width. Athletes who are strictly working on their one-armed movements. Outside of the two types of kettlebells, it’s a good idea to understand some basic construction features that come along with each type. Below, we’ll cover three important construction characteristics that are worth noting in kettlebell practice and investments. The first construction feature worth noting is the type of material a company uses to create their kettlebell. Most kettlebells will be made of iron, but not all iron is created equal. For example, a single cast iron kettlebell will typically be better than one that has been created with multiple types, plugs, or inserts. Single cast kettlebells will be cast once during the casting process, which means they’ll be a bit more accurate in size and weight, too. The coating of kettlebells can vary as well. For example, some popular kettlebell coatings you’ll typically see are unfinished iron, rubber, powder coating, and military grade e-coating. These will all vary in feel and durability. Typically, powder coating, rubber, and any form of military grade e-coating will be better bets for long-term durability, as they’ll be more resilient to premature rusting and breakdown. For this article, we’ll rope outer kettlebell sleeves into this coating section. Some kettlebells come with outer sleeves, which make them decent options for indoor workouts. Although, these vinyl or rubber sleeves can then cause the kettlebell to sit less flat, so it’s a construction aspect that should be weighted per one’s main kettlebell usage setting. In the different kettlebell types above we covered how handles will differ based on the kettlebell’s use, but handles can also differ in diameter and feeling. 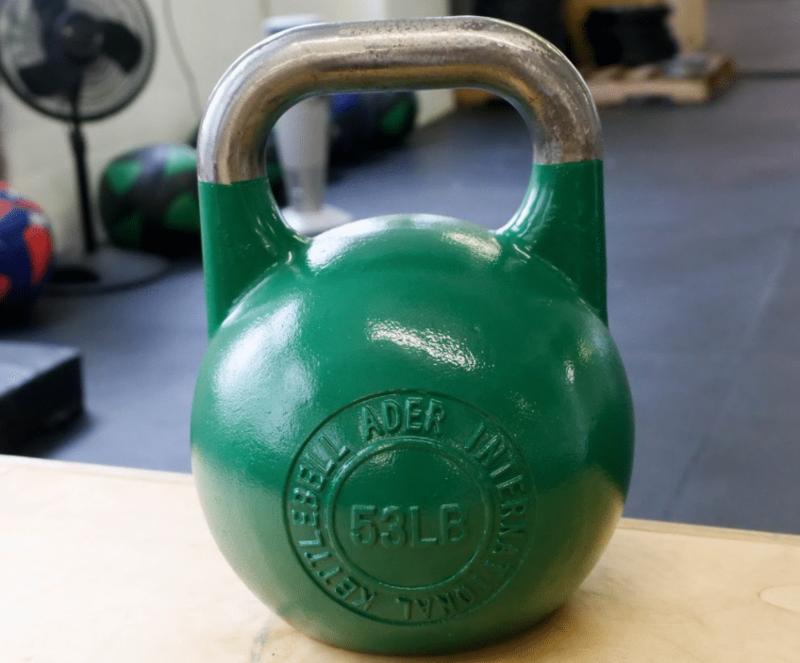 Some of the off brand kettlebells can have handles that are much wider than competition bells, or even your standard cast iron bells, which can make them less than ideal for a lot of users. Anytime you see a handle that lists a diameter well over 35mm-38mm, then you may want to size up your hand and what that kettlebell’s prospective diameter. Another handle difference is the finish of the handle. Steel, powder coated, and unfinished handles will all take chalk differently, so if you use chalk frequently, then this is another area you may want to explore. We cover this topic heavily in our Best Kettlebell Round-Up below! The last construction aspect we’ll note in this article is the bottom’s finish of the kettlebell. For most athletes, a flat bottom finish will serve them best. This means that the kettlebell was completely flattened with the use of a machine to obtain a kettlebell that sits evenly on the floor. It’s subtle, but this construction aspect supports a kettlebell’s ability to stay upright when working through circuits, as opposed to toppling over due to an uneven bottom. Kettlebells come in all shapes and sizes, but there tends to be two main types of kettlebells. You have standard cast iron kettlebells and competition kettlebells. Both of these will vary in construction, but their versatility remains consistent. Potentially the biggest aspect to keep in mind is how you plan to use the bell most often, as this will help guide you to find your best fitting kettlebell.